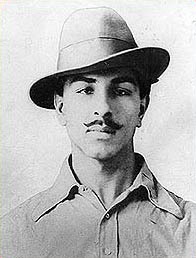 September 28, Birthday of a National Hero or The Great son of the Nation, Bhagat Singh. Many act of remembrance of him has been done like passing sms (Everyone celebrate the birthday of Mahatma Gandhi on 2nd of October, 28th September is the birthday of Bhagat Singh. Does nobody know that? At least pass this sms to everyone, let the real hero be respected.) from one mobile to other. Now my question is do the nation really want the presence of Bhagat Singh in recent time, just to celebrate the birthday of Bhagat Singh. Bhagat Singh, who had set an example of supreme sacrifice in the history of Indian National Movement of freedom. The boy who was very intellectual mind and a very advance thinker. Who had sacrificed his life for the nation without any hesitation or any demand to live in free India. Who did set a vision of free India, A Nation which would be free not only from English government but free from casteism, regionalism, gender differences etc. and more important of exploitation from man to man and nation to nation. He wanted to change the present system based on exploitation of human, particularly farmers and labors. A vision in which everyone has an equal opportunity to grow and live, we all are Indians and belongs to India . But I think the vision of the Bhagat Singh doesn’t convert into the realty even after 80 years of his sacrifice. Politics of caste is still going on, communal riots are still happening, corruption is running the country, gender differences are still matter of concern. Is this was the Nation of Bhagat Singh’s dream? This was just the transformation of power from English government to some rich and influential people who belongs to the same country. The gap between rich and poor become so high that it cannot be able to fill by next two generations. 80% people are exploited by the 20% people. In the age of just 23 yrs Bhagat Singh set an example for the youth of this country. Now if someone can make true the vision of Bhagat Singh then it is only the youth of this country. But the sad thing about the youth that it is being involved in some vulgar , violence activities and exploited for self motives. I am not saying that someone has to sacrifice his life. I am just urging the youth of this country that be the unit of complete social revolution against any kind of exploitation and do whatever you can do at your place with your capabilities without making any harm to human life as nothing costly than a human life. Try to reduce the gaps between rich and poor , big and small try to free from casteism , regionalism , reduce gender differences , do not involve in any kind of communal riots or the activities which likely to harmful for the human life in anyway. If all this could happen then definitely we will achieve the real freedom. I don’t like to be the victim of coming generation when they will ask me that what would I had done when I could do? If this can happen than we don’t need any symbolic celebration to remember him as he will always among us. I pay my tribute to Bhagat Singh with my heart and promise myself that he and his futuristic thoughts will always be in my memories till the end of my life and also try to implement in my life. Would you? Yes why NOT, we should , we must and we have to rember him, if we want such kind of leader again, otherwise we would be spolished our dignity and legitimacy in this communal society.